A seasonal quilt you never have to put away when the season changes! If you are like me and are always late changing your decorations for the season, this is the quilt for you! ​Measuring 62½" x 80½", Changing Seasons goes from the lights & brights of Spring & Summer to the jewel tones of Autumn & Winter. Composed of four different blocks for the Pinwheel, Leaf, Trees & Tulip rows, this beautiful pieced quilt will grace your home all season long. 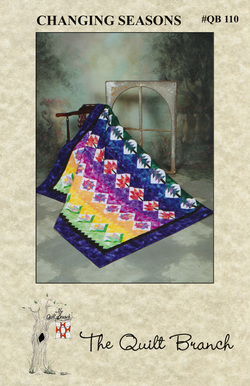 All Benartex fabric numbers are listed on the pattern if you wish to use their fabrics to complete your own quilt.